The profound crisis of human identity brought on by living within a lie, a crisis which in turn makes such a life possible, certainly possesses a moral dimension as well; it appears, among other things, as a deep moral crisis in society. 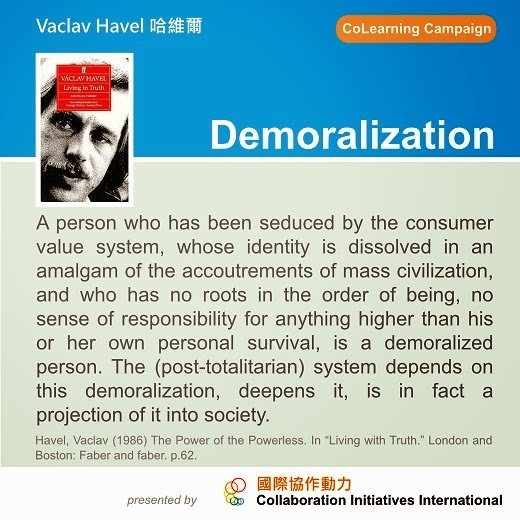 A person who has been seduced by the consumer value system, whose identity is dissolved in an amalgam of the accoutrements of mass civilization, and who has no roots in the order of being, no sense of responsibility for anything higher than his or her own personal survival, is a demoralized person. The system depends on this demoralization, deepens it, is in fact a projection of it into society. Living within the truth, as humanity’s revolt against an enforced position, is, on the contrary, an attempt to regain control over one’s own sense of responsibility. In other words, it is clearly a moral act, not only because one must pay so dearly for it, but principally because it is not self-serving: the risk may bring rewards in the form of a general amelioration in the situation, or it may not. In this regard, as I stated previously, it is an all-or-nothing gamble, and it is difficult to imagine a reasonable person embarking on such a course merely because he or she reckons that sacrifice today will bring rewards tomorrow, be it only in the form of general gratitude. Havel, Vaclav (1986) The Power of the Powerless. In “Living with Truth.” London and Boston: Faber and faber. p.62.